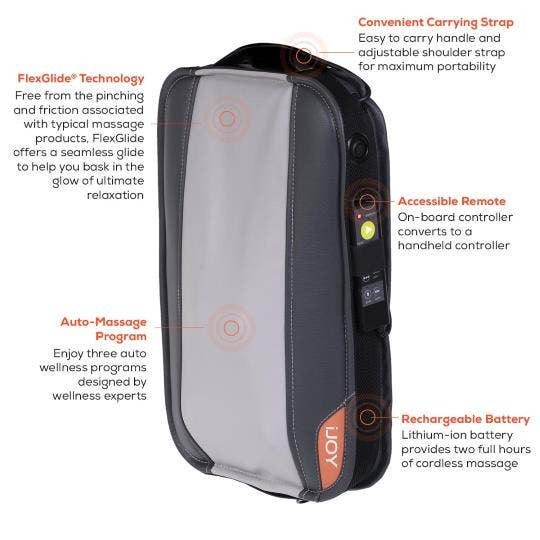 The Human Touch iJoy Massage Anywhere is a powerful, portable solution for the perfect massage anytime (and anywhere) you need to recharge and soothe tired muscles. 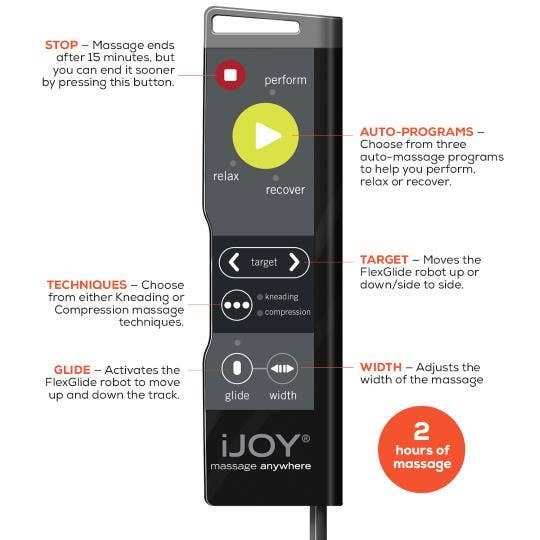 Delivering the same powerful FlexGlide orbital massage that you know and love from the iJoy Active massage chair, the Massage Anywhere replicates techniques used by massage professionals to relax and recharge your body. Enjoy any of three intelligently designed, invigorating auto-massage programs, or customize your experience for the perfect massage, no matter where the day takes you! Choose a technique to suit your mood. Massage Anywhere lets you customize your experience using a wide variety of massage techniques. No matter how you use it, your massager offers maximum massage flexibility and therapeutic benefits. The Massage Anywhere battery system has power to spare. Two hours of run time means up to 8 massage sessions per charge. The included smart charger will take the lithium-ion battery back to 100% overnight. Enjoy the benefits of real massage in a portable, cordless package for the home, the office, or on the go. FlexGlide orbital massage technology replicates techniques used by massage professionals. Hand-held remote controls 3 programmed massages designed by wellness experts.